Hostel Connect is located on the Strand Road, the main through fare and bus route of the city. We are literally 2 -5 minutes from the famous historic walls dating back to 1613; the Bogside area which is home to the famous Bogside Murals and the tragic and controversial Bloody Sunday conflict of 1972; and Waterloo Square where many of bars are located. We offer a free continental breakfast with each night stay, free wifi throughout the hostel and smiles are always free. Our aim at Hostel Connect is to provide budget-orientated sociable accommodation where guests can stay and enjoy the ‘craic’ in Derry, in a safe, clean and fun environment. Our check-in is between 3pm and 8pm and our reception closes at 10pm. If you are arriving later than 8pm, you MUST inform the hostel by email or telephone. Failure to do so, will result in you being possibly refused entry and being charged for the night. All guests must provide Photo ID with their address. Please contact the office using the information on the reservation confirmation received after booking. Our aim at Hostel Connect is to provide budget-orientated sociable accommodation where guests can stay and enjoy the craic in Derry, in a safe, clean and fun environment. 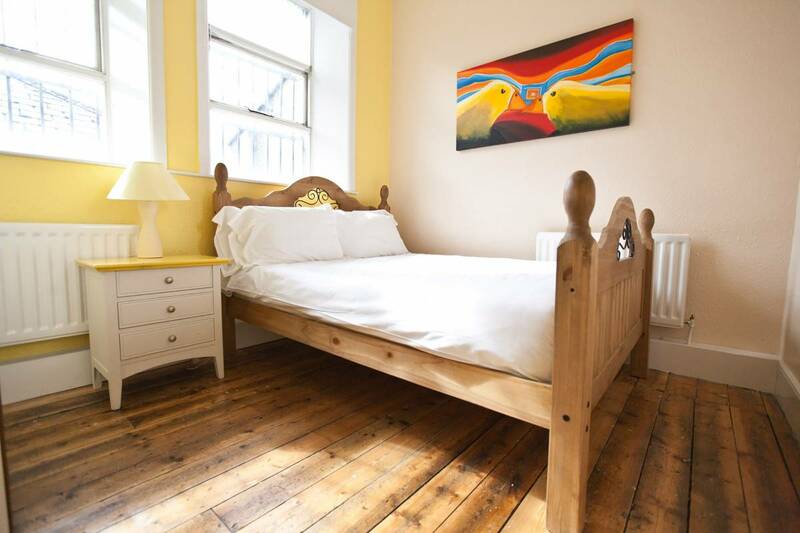 We have lovingly brought back the original wooden floors throughout most of the hostel adding a great ambience. 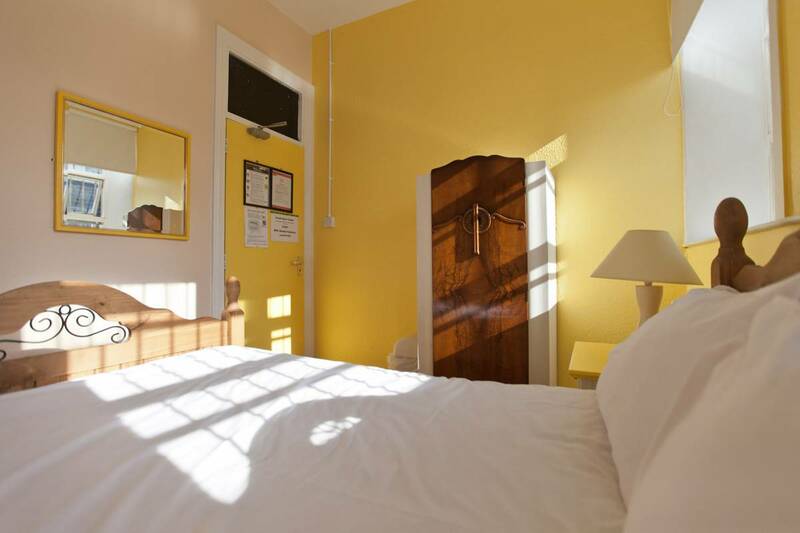 Each room is named after the funky colour that it has been painted! The hostel also boasts and huge common room where you can chill and hang out on sofas and watch TV or movies on our large screen TV. 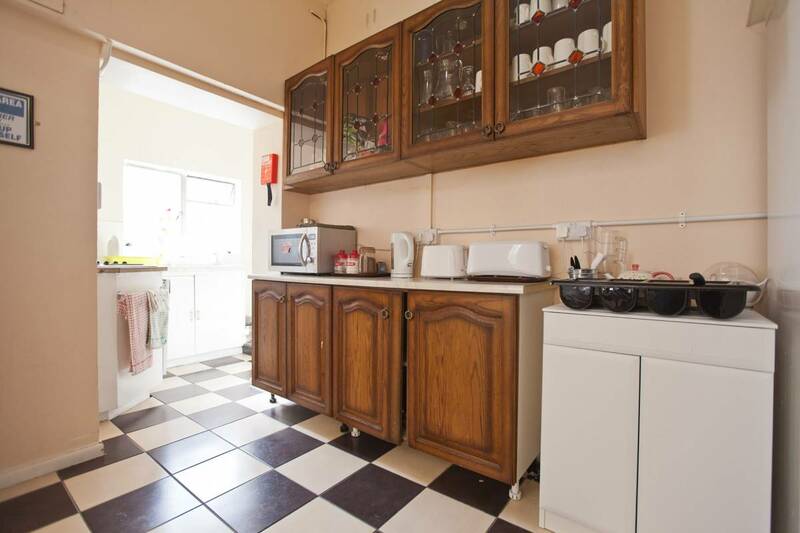 The hostel also has a good size kitchen and dining area (open 8am -10:30pm) on the first floor. There are 6 separate shower rooms (electric so you'll never run out of hot water), 3 on each floor. We offer a free continental breakfast with each night stay, free wifi throughout the hostel and smiles are always free. Hostel Connect has 10 bedrooms consisting of two 15 bed mixed dorms, 9 bed mixed dorms 6 bed mixed dorm, 6 bed female only dorm, a Family room (King and triple bunk), three private double rooms and a private twin room . The hostel can accommodate 67 people and is laid out over 2 floors. There are 6 separate electric shower rooms, 3 on each floor. 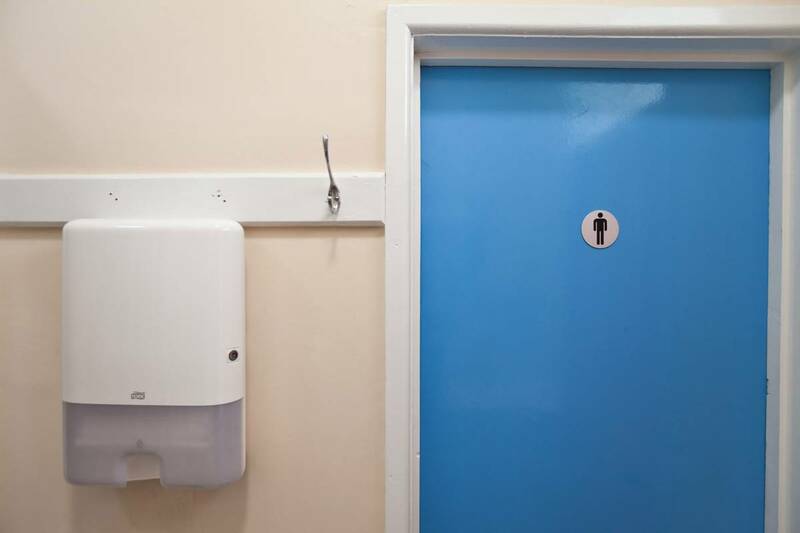 The bathroom facilities on the top floor have a shower, sink and toilet in each bathroom and the first floor consists of 3 separate shower rooms, 3 toilet rooms and a 3 sink room. Dorm rooms have separate security lockers and plenty of storage space, most private rooms have wardrobes and bedside tables and for the security conscious there is a safe at reception for any personal valuables. 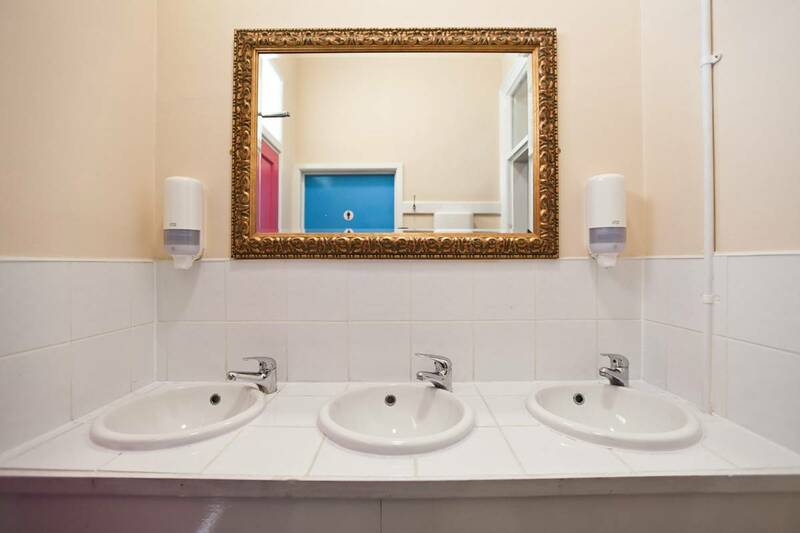 We offer a free continental breakfast with each night stay and free wifi throughout the hostel. The main kitchen and dining area (open 7am -10:30pm) is located on the first floor. 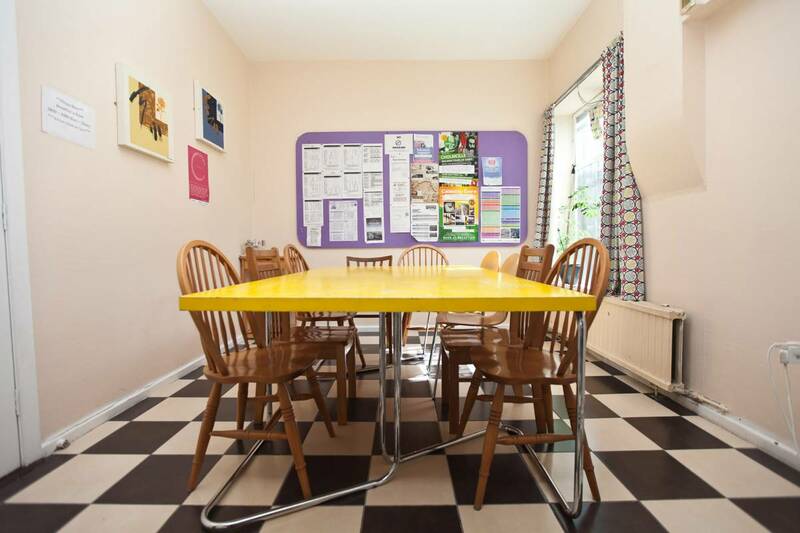 The hostel boasts a huge common room, equipped with a number of microwave ovens. The building prior to the hostel was an old architect’s office for 50 years. Hostel Connect has been completely renovated, keeping it's quirkiness and some of it's history. Located in the heart of the city centre, the hostel is on the main bus route and is only short walk to pubs, restaurants and shopping. There is movie theatre and shopping complex across the street from Hostel Connect and a 24 hr convenience store, chemist/drug store and barber shop below us. The street is well lit for making your way back to hostel at night. We are seconds away from the Quay where you can take stroll along the banks of the Foyle River. We are on the City side and the other side of the River Foyle is called the Waterside. We are a 5 min walk to the Millennium Forum, the Play House, the iconic Peace Bridge and Ebrington Square. This property has a 3 day cancellation policy. Failure to cancel within this time will result in a cancellation charge equal to the full amount due. Please visit our website: to review all our cancellation policies, including those for groups. ALL guests MUST provide photo ID at check-in, no exceptions. Hostel Connect will take a copy of this and attach it to your check-in form for security reasons. You may request this copy when checking out. Bookings cannot be accepted from any person under the age of 18 unless they are accompanied by an adult (18 or over). Guests who wish to bring their children under 14 years of age must book a whole dorm or private room. For guests aged 14 or 17 years of age, they can book into one of dorm rooms, but must be accompanied by an adult (aged 18 or over). We do not have an upper age limit but the majority of our guests are backpackers/tourists in the 18 to 30 age range. Check-In is from 3pm until 8pm, however you can check-in up to 11pm. If you will be arriving after 8pm, you MUST inform the hostel or your beds maybe resold and your booking cancelled. Any booking over 6 people is considered a group booking. Group policies can be found by visiting our website. Look out for the shuttle bus that will be waiting outside of the station after every train arrives. It will take you to the bus station, which is located in the city centre on Foyle street. Just get on the bus with everyone else. Its free. The train station is located 5 minutes out of the city centre, on the waterside. Once at the bus station, follow the directions above or grab a cab. The airport is about a 20 minute drive from the city centre. Most flights are serviced by the Airporter bus service. It drops off at the Airporter Bus Terminal which is at the far end of the Strand Road situated on the edge of the city centre. The fare is £5. From Airporter bus terminal it’s about a 15 minute walk to Hostel Connect, if you’re up to it. Just ask the staff to point you in the right direction, but it’s fairly easy and once on the Strand Road you just keep walking straight towards the City Centre. A taxi from the Airporter Terminal to the hostel will run you £2. 50 – £3. A taxi from the airport will cost around £12/13 , so for more than one person, this makes a better option. The Airporter Bus Service run shuttles from both airports every 2/3 hours. It takes 90 mins from Belfast International and 120 mins fron Belfast City Airport. Fares are £18. 50 single and £29. 50 return. Ulster Bus also leaves Belfast at regular intervals.